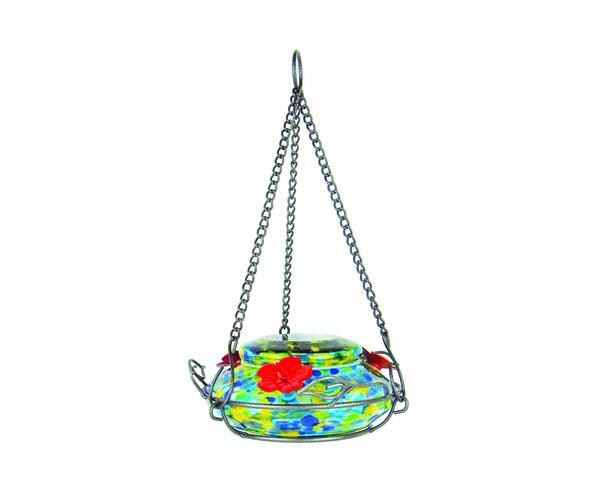 LED Illuminated Hummingbird Feeders utilizes a beautiful, thick hand-blown glass base and lid holding up to 18 oz. The LED light transforms this feeder into a beautiful decorative night time lantern for your landscape. It features Easy Fill & Clean lid with a 3 inch wide opening and silicone gaskets for Leak Free fit. Removable parts for easy cleaning. All glass, silicone and flower ports are dishwasher safe. This feeder comes with a decorative powder-coated perching ring.